The title of brightest LED flashlight is a moving target as LED technology advances and new products regularly come along to take the crown. However, below I have made a stab at compiling a current list of brightest LED flashlights at the risk of it going out of date momentarily. Still, at the very least it is a list of some very bright LED flashlights. Also you will note that contenders for brightest LED flashlight use both multiple bulbs and newer super bright LEDs. Obviously you will prefer the latter if you want compactness, but if you don’t care, then the more LEDs, the better until the unit becomes unwieldy. 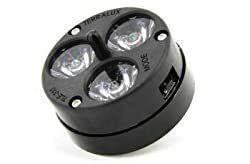 Technically, the TerraLUX MiniStar310 M-EX 1000 Lumen LED Upgrade Kit for Maglite 4-6 D Cell Lights – Multi-mode isn’t a flashlight. It is a $57.95 street price replacement “bulb” for 4 to 6 cell Maglites that converts them into a whopping 1000 lumen LED flashlight. Of course, the Ministar actually uses three of the latest super bright LEDs to make this possible. It is electronically regulated for constant light output and has multi-mode function, (high/medium/low) which is configurable to single mode via a switch on the side of module. TerraLUX makes a line of similar LED upgrades for most Maglite models. Guide Gear sells some brighter flashlights than the Guide Gear 800 Lumen Light but I like it for the traditional flashlight form factor. It uses 3 D batteries (not included) and is 13 1/4″ long and weighs 1 1/2 lbs. It is also dimmable from 100% to 0% and has a high-tension tail cap for solid connections. The bulb is a 10W Cree XML T6 LED and the body is impact-resistant, high-grade anodized aluminum and it is weather resistant with compression resistant O-rings. Street price is approx. $80.00. The Fenix TK41-U2 860 Lumens Cree XM-L (U2) LED Flashlight uses a single Cree XM-L(U2) LED with a max of 860 Lumens output. The TK41 uses eight 1.5V AA batteries (Alkaline or Ni-MH rechargeables) and has multiple modes: 4 types of primary output: Turbo Mode: 860 lumens -> Low: 15 lumens -> Mid: 120 lumens -> High: 365 lumens plus 2 flashing functions including an SOS mode all selected via neck mounted dual switch system. 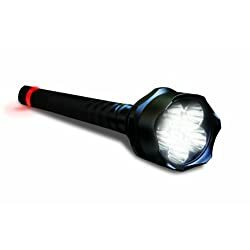 Other features that you get for the $129.95 street price are a deep reflector for a powerful focused light with longer throw; constant brightness with efficient digitally regulated output circuitry and reverse polarity battery protection; durable Type III hard-anodized anti-abrasive finish on the aircraft aluminum (1.55″ diameter, 2.5″ head diameter, 8.4 ” long) body; waterproof to IPX-8 Standard; and toughened ultra-clear glass lens with anti-reflective coating. The TK41 is also capable of standing up securely on a flat surface to serve as a candle. The included accessories are a shoulder strap, lanyard, rubber switch boot and two spare o-rings. 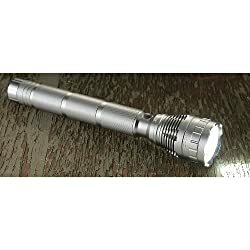 The Mflare 40421 Ultra Bright Tactical Luxeon LED Aluminum Flashlight Torch Baton features 7 precision focus Luxeon Rebel 90 LEDs with a maximum output to 1000 Lumens. 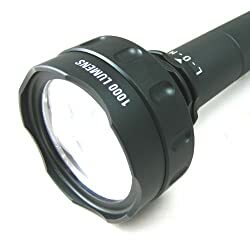 The heavy-weight anodized aluminum Housing is 17 inches long with a width of 3.5″ at the widest part so it is reasonably compact despite all the bulbs and the fact that is uses 6 1.5V D Size alkaline or rechargeable batteries. The current Amazon price is only $99 which seems quite reasonable. Other features include a 1x to 4x Focus Control to adjust the beam throw and a Low > Off > High Twist Neck for with no button to turn it on accidentially. The Life Gear LG454 Highland Tactical LED Flashlight with Red Tail Emergency Flasher, 1000 Lumens uses 5 Cree LEDs for 1000 lumens output. The LG454 uses 6 C Size Batteries to provide the 3 main light modes (High, Low, and Strobe) and 2 CR2032 button cell batteries (included) for the Emergency Red Flasher and Glow modes in the tail. It is 17.75″ long and 2.7″ in diamater at the widest part and very sturdily constructed of heavyweight aluminum with a shatterproof lens and is waterproof to the IP44 Standard. The street price should be less than $160 but they seem to be in short supply and hard to find. Last updated on Friday, December 7th, 2012 at 12:15 pm	and filed under LED Flashlights.